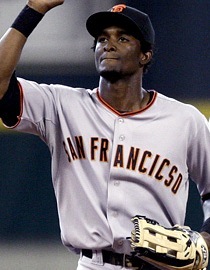 Eugenio Velez, as a member of the San Francisco Giants in 2010, with a typo on his jersey. 2011: Eugenio Velez, a reserve infielder for the Los Angeles Dodgers, sets a Major League Baseball record by finishing the 2011 season 0 for 37. It’s the first time in modern baseball history that a non-pitcher with that many at-bats goes hitless in a season. 2009: USC tailback Stafon Johnson is bench-pressing in the football team’s weight room when the bar slips from his right hand and falls on his throat. Johnson undergoes an emergency tracheotomy and seven hours of reconstructive surgery at California Hospital Medical Center. 2008: Major League Baseball’s Pittsburgh Pirates end the 2008 season with a 6-1 win over the San Diego Padres and finish the year with a 67-95 win-loss mark, tying the record for most consecutive losing seasons (16) by a major American professional sports team. 2008: Major League Baseball’s Seattle Mariners end the 2008 season with a 4-3 win over the Oakland Athletics and finish the year with a 61-101 record, making the Mariners the first team in baseball history with a $100 million payroll to lose 100 games. 2003: Little Joe, a 300-pound adolescent gorilla escapes from his enclosure at the Franklin Park Zoo in Boston. During his two hours of freedom he snatches a two-year-old girl and injures a teenager before being subdued with tranquilizer darts. The incident is Little Joe’s second breakout in two months. 1994: The Estonia, a large car-and-passenger ferry en route from Tallinn (the capital city of Estonia) to Stockholm, sinks during a Baltic Sea storm, killing 852 people. In the aftermath, a Swedish-Finnish-Estonian government committee blames the disaster on the stormy weather, which caused water to pour through an open bow door and into the Estonia’s car deck. 1920: Eight members of the Chicago White Sox baseball team are indicted in the Black Sox scandal. The players are accused of throwing the 1919 World Series against the Cincinnati Reds.